Vannevar Bush (pronounced van-NEE-ver) (March 11, 1890 – June 30, 1974) was an American engineer and science administrator, known for his work on analog computing, his role in the development of the atomic bomb and other weapons during World War II, and the idea of the memex—seen as a pioneering concept for the World Wide Web. As an adviser to President Franklin D. Roosevelt and head of the National Defense Research Committee (later subsumed into the Office of Scientific Research and Development), he helped coordinate scientific research with military objectives and played a key role in the victory of the Allies. After World War II, he remained a prominent policymaker and public intellectual ("the patron saint of American science") during the ensuing Cold War. Through his public career, Bush was a proponent of technological innovation and entrepreneurship for both economic and geopolitical security. Vannevar Bush was born in Everett, Massachusetts, to Richard Perry Bush (unrelated to the Bush political family) and Emma Linwood Paine. He was educated at Tufts College, graduating in 1913. From mid-1913 to October 1914, he worked at General Electric (where he was a supervising "test man"); during the 1914-1915 academic year, Bush taught math at Jackson College (the sister school of Tufts). After a summer working as an electrical inspector and a brief stint at Clark University as a doctoral student of Arthur Gordon Webster, he entered the Massachusetts Institute of Technology (MIT) electrical engineering program. Spurred by the need for enough financial security to marry, Bush finished his thesis in less than a year. In August 1916, he married Phoebe Davis, whom he had known since Tufts, in Chelsea, Massachusetts. He received a doctorate in engineering from MIT (and Harvard University, jointly) in 1917—following a dispute with his adviser Arthur Edwin Kennelly, who tried to demand more work from Bush. During World War I, he worked with the National Research Council in developing improved techniques for detecting submarines. He joined the Department of Electrical Engineering at MIT in 1919, and was a professor there from 1923–32. He constructed a Differential Analyzer, an analog computer that could solve differential equations with as many as 18 independent variables. An offshoot of the work at MIT was the birth of digital circuit design theory by one of Bush's graduate students, Claude Shannon. Bush became vice-president and dean of engineering at MIT from 1932–38. This post included many of the powers and functions subsumed by the Provost when MIT introduced this post in 1949, including some appointments of lecturers to specific posts. In 1939, Bush accepted the prestigious appointment as president of the Carnegie Institution of Washington, which awarded large sums annually for research. As president, Bush was able to influence the direction of research in the U.S. towards military objectives and could informally advise the government on scientific matters. In 1939, he fully moved into the political arena with his appointment as chairman of National Advisory Committee for Aeronautics, which he headed through 1941. Bush remained a member of NACA through 1948. During World War I, Bush had seen the lack of cooperation between civilian scientists and the military. 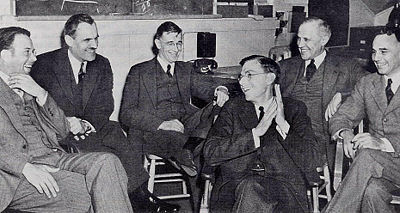 Concerned about the lack of coordination in scientific research in the U.S. and the need for all-out mobilization for defense, Bush, in 1939, proposed a general directive agency in the Federal Government, which he often discussed with his colleagues at NACA, James B. Conant (President of Harvard University), Karl T. Compton (President of M.I.T. ), and Frank B. Jewitt (President of the National Academy of Sciences). Bush continued to press for the agency's creation. Early in 1940, at Bush's suggestion, the secretary of NACA began preparing a draft of the proposed National Defense Research Committee (NDRC) to be presented to Congress. But when Germany invaded France, Bush decided speed was of the essence and approached President Roosevelt directly. He managed to get a meeting with the President on June 12, 1940, and took a single sheet of paper describing the proposed agency. Roosevelt approved it in ten minutes. NDRC was functioning, with Bush as chairman and others as members, even before the agency was made official by order of the Council of National Defense on June 27, 1940. Bush quickly appointed four leading scientists to NDRC: NACA colleagues Conant, Compton, and Jewitt, and also Richard C. Tolman, dean of the graduate school at Caltech. Each was assigned an area of responsibility. Compton was in charge of radar, Conant of chemistry and explosives, Jewitt of armor and ordnance, and Tolman of patents and inventions. Government officials then complained that Bush was making a grab for power, by-passing them. Bush later agreed: "That, in fact, is exactly what it was." This co-ordination of scientific effort was instrumental in the Allies winning the Second World War. Alfred Loomis said that, "Of the men whose death in the summer of 1940 would have been the greatest calamity for America, the President is first and Dr. Bush would be second or third." In 1941, the NDRC was subsumed into the Office of Scientific Research and Development (OSRD) with Bush as director, which controlled the Manhattan Project until 1943 (when administration was assumed by the Army), and which also coordinated scientific research during World War II. In all, OSRD directed 30,000 men and oversaw development of some 200 weapons and instrumentalities of war, including sonar, radar, the proximity fuse, amphibious vehicles, and the Norden bomb sight, all considered critical in winning the war. At one time, two-thirds of all the nation’s physicists were working under Bush’s direction. In addition, OSRD contributed to many advances in the physical sciences and medicine, including the mass production of penicillin and sulfa drugs. In a memo to Bush dated March 20, 1942, President Roosevelt wrote, "I have read your extremely interesting report and I agree that the time has come for a review of the work of the Office on New Weapons…. I am returning the report for you to lock up, as I think it is probably better that I should not have it in my own files." OSRD continued to function actively until some time after the end of hostilities, but by 1946 and 1947, it had been reduced to a skeleton staff charged with finishing work remaining from the war period. It had been hoped by Bush and many others that with the dissolution of OSRD, an equivalent peacetime government research and development agency would replace it. Bush felt that basic research was the key to national survival, both from a military point of view and in the commercial arena, requiring continued government support for science and technology. Technical superiority could be a deterrent to future enemy aggression. In July 1945, in his report to the President, Science, The Endless Frontier, Bush wrote that basic research was: "The pacemaker of technological progress” and "New products and new processes do not appear full-grown. They are founded on new principles and new conceptions, which in turn are painstakingly developed by research in the purest realms of science!" He recommended the creation of what would eventually become in 1950 the National Science Foundation (NSF), in an effort to cement the ties between academic science, industry, and the military which had been forged during the war. Simultaneously, in July 1945, the Kilgore bill was introduced in Congress proposing a single science administrator appointed and removable by the President, with heavy emphasis on applied research, and a patent clause favoring a government monopoly. In contrast, the competing Magnuson bill leaned towards Bush's proposal to vest control in a panel of top scientists and civilian administrators with the executive director appointed by them, to place emphasis on basic research, and to protect private patent rights. A compromise Kilgore-Magnuson bill of February 1946, passed the Senate but died in the House because Bush threw his support to a competing bill that was a virtual duplicate of the original Magnuson bill. In February 1947, a Senate bill was introduced to create the National Science Foundation to replace OSRD, favoring most of the features advocated by Bush, including the controversial administration by an autonomous scientific board. It passed the Senate on May 20 and the House on July 16, but was vetoed by Truman on August 6, on the grounds that the administrative officers were not properly responsible to either the President or Congress. In the meantime, Bush was still in charge of what was left of OSRD and fulfilling his duties as president of the Carnegie Institution of Washington. In addition, Bush, postwar, had helped create the Joint Research and Development Board (JRDB) of the Army and Navy, of which he was chair. With passage of the National Security Act, signed into law in late July 1947, the JRDB became the Research and Development Board (RDB). It was to promote research through the military until a bill creating the National Science Foundation finally became law. It was assumed President Truman would naturally appoint Bush chairman of the new agency, and behind the scenes Bush was lobbying hard for the position. But Truman’s displeasure with the form of the just-vetoed NSF bill backed by Bush now came into play. Truman viewed it as a power grab by Bush. His misgivings about Bush came out publicly on September 3, 1947: He wanted more time to think about it and reportedly told his defense chiefs that if he did appoint Bush, he planned to keep a close eye on him. However, Truman finally relented. On September 24, Bush met with Truman and Secretary of Defense James Forrestal, where Truman offered the position to Bush. Initially, the RDB had a budget of 465 million dollars to be spent on "research and development for military purposes." Late in 1947, a directive issued by Forrestal further defined the duties of the board and assigned it the responsibility and authority to "resolve differences among the several departments and agencies of the military establishment." However, the scope and authority Bush had as chairman of the RDB, was a far cry from the power and influence he enjoyed as director of OSRD and the agency he hoped to create postwar almost independent of the Executive branch and Congress. Bush was never happy with the position and resigned as chairman of the RDB after a year, but remained on the oversight committee. Despite his later shaky relationship with Truman, Bush’s advice on various scientific and political matters was often sought out by Truman. When Truman became President and first learned of the atomic bomb, Bush briefed him on the scientific aspects. Soon after, in June 1945, Bush was on the committee advising Truman to use the atomic bomb against Japan at the earliest opportunity. In Pieces of Action, Bush wrote that he thought use of the bomb would shorten the war and prevent many American casualties. Bush's vision of how to apply the lessons of OSRD to peacetime, Science, The Endless Frontier, was written in July 1945, at Truman's request. Immediately after the war, debates raged about future uses of atomic energy and whether it should be placed under international control. In early 1946, Bush was appointed to a committee to work out a plan for United Nations control. According to Truman in his memoirs, Bush advised him that a proposal to Russia for exchange of scientific information would open the door to international collaboration and eventually to effective control, the alternative being an atomic bomb race. Bush wrote in a memo, “The move does not involve ‘giving away the secret of the atomic bomb.' That secret resides principally in the details of construction of the bombs themselves, and in the manufacturing process. What is given and what is received is scientific knowledge.” Bush felt that attempts to maintain scientific secrets from the Russians would be of little benefit to the U.S. since they would probably obtain such secrets anyway through espionage while most American scientists would be kept in the dark. In September 1949, Bush was also appointed to a scientific committee reviewing the evidence that Russia had just tested its first atomic bomb. The conclusions were relayed to Truman, who then made the public announcement. Bush continued to serve on NACA through 1948, and expressed annoyance with aircraft companies for delaying development of a turbojet engine because of the huge expense of research and development plus retooling from older piston engines. From 1947 to 1962, Bush was also on the board of directors of American Telephone and Telegraph. In 1955, Bush retired as President of the Carnegie Institution and returned to Massachusetts. From 1957 to 1962, he was chairman of the pharmaceutical giant Merck & Co.. He introduced the concept of what he called the memex in the 1930s, a microfilm-based "device in which an individual stores all his books, records, and communications, and which is mechanized so that it may be consulted with exceeding speed and flexibility." After thinking about the potential of augmented memory for several years, Bush set out his thoughts at length in the essay, "As We May Think" in the Atlantic Monthly, which is described as having been written in 1936, but set aside when war loomed. He removed it from his drawer and it was published in July 1945. In the article, Bush predicted that "Wholly new forms of encyclopedias will appear, ready made with a mesh of associative trails running through them, ready to be dropped into the memex and there amplified." A few months later (September 10, 1945) Life magazine published a condensed version of "As We May Think," accompanied by several illustrations showing the possible appearance of a memex machine and its companion devices. This version of the essay was subsequently read by both Ted Nelson and Douglas Engelbart, and was a factor in their independent formulations of the various ideas that became hypertext. Bush did not refer in his popular essay to the microfilm-based workstation proposed by Leonard Townsend in 1938, or the microfilm- and electronics-based selector described in more detail and patented by Emmanuel Goldberg in 1931. The memex is still an important accomplishment, because it directly inspired the development of hypertext technology. Vannevar Bush overestimated some technological challenges. His name has been applied to such underestimates in jargon. He asserted that a nuclear weapon could not be made small enough to fit in the nose of a missile as in an ICBM. In his book Modern Arms and Free Men, published in 1949, he originally predicted that it would be ten more years before the USSR developed nuclear weapons. The book was on the press when the West detected the first Soviet nuclear test in late August 1949. The presses were duly stopped, and the text corrected. Bush privately, and then publicly, opposed NASA's manned space program and took the unpopular stance of attacking the Moon exploration goals set forth by president John F. Kennedy at a time when the U.S. was nearly perfectly united in supporting it. His opposition was based on fiscal reasons and on his calculated judgment that human lives would be lost in what he considered to be an extremely risky adventure, from an engineering standpoint. This conservative stance is taken to reinforce his reputation as a poor prophet in technological matters, since the deaths in Project Apollo were on the ground, the Apollo 13 crew survived, and the two previous programs were completed without astronaut fatalities. His rational warnings were largely ignored then, and were mostly forgotten by the time the Space Shuttle Challenger and Columbia disasters took 7 lives each in 1986 and 2003, respectively. In 1922, Bush and his college roommate, Laurence K. Marshall, set up the American Appliance Company to market a device called the S-tube. This was a gaseous rectifier invented by C.G. Smith that greatly improved the efficiency of radios. Bush made a lot of money from the venture. Eventually the name was changed to Raytheon, an electronics giant and defense contractor. One of Bush's PhD students at MIT was Frederick Terman, who was instrumental in the genesis of "Silicon Valley." Canadian government documents from 1950 and 1951 involving the Canadian Defence Research Board, Department of Transport, and Embassy in Washington D.C., implicate Bush as heading up a highly secret UFO study group within the U.S. Research and Development Board. Bush was opposed to the introduction of Nazi scientists into the U.S. under the secretive Project Paperclip, thinking that they were potentially a danger to democracy. Bush and his wife, Phoebe, had two sons: Richard Davis Bush and John Hathaway Bush. 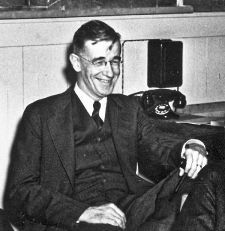 Vannevar Bush died at age 84 from pneumonia after suffering a stroke in 1974, in Belmont, Massachusetts. A lengthy obituary was published on the front page of the New York Times on June 30. As of 1947, Bush had received fourteen honorary degrees and ten medals. In 1943, he received the AIEE's Edison Medal, "For his contribution to the advancement of electrical engineering, particularly through the development of new applications of mathematics to engineering problems, and for his eminent service to the nation in guiding the war research program." After World War II, President Truman awarded Bush the Medal of Merit. President Lyndon Johnson awarded Bush the National Medal of Science. In 1970, he received the Atomic Pioneers Award from the Atomic Energy Commission. The Vannevar Bush Award was created by the National Science Foundation in 1980, to honor contributions to public service. Fellow of the American Academy of Arts and Sciences, National Academy of Sciences, American Institute of Electrical Engineers, American Physical Society, and National Science Foundation. Member of the American Association for the Advancement of Science, the Society for the Promotion of Engineering Education, the American Philosophical Society, and the American Mathematical Society. Trustee of Tufts College, the Woods Hole Oceanographic Institution, Johns Hopkins University, and the Brookings Institution. Life member of the M.I.T. corporation and a regent of the Smithsonian Institution. 1945, July, "As We May Think," Atlantic Monthly. 1945, Science: The Endless Frontier, a report to president Truman outlining his proposal for post-war U.S. science and technology policy. Retrieved November 3, 2007. 1946, Endless Horizons, a collection of papers and addresses. 1949, "Modern Arms and Free Men," a discussion of the role of science in preserving democratic institutions. 1970, "Pieces of the Action," an examination of science and the state. ↑ Zachary, Endless Frontier, p 3. ↑ Zachary, Endless Frontier, p. 11-34. ↑ Franklin D. Roosevelt Presidential Library, Memorandum for Dr. Vannevar Bush. Retrieved November 3, 2007. ↑ NASA, History. Retrieved May 20, 2008. ↑ catb.org, Vannevar Bush. Retrieved May 20, 2008. ↑ Arthur Bray, The UFO Connection (Jupiter Publishing, 1979, ISBN 0-9690135-1-5). Buckland, Michael K. 1992. Emanuel Goldberg, Electronic Document Retrieval, and Vannevar Bush's Memex. Journal of the American Society for Information Science 43 (4): 284–294. Bush, Vannevar, James M. Nyce, and Paul Kahn. 1991. From Memex to Hypertext: Vannevar Bush and the Mind's Machine. Boston: Academic Press. ISBN 0125232705. Rothe, Anna, and Constance Ellis. 1948. Current Biography. Who's News and Why 1947. New York: H.W. Wilson. Waldrop, M. Mitchell. 2001. The Dream Machine: J. C. R. Licklider and the Revolution that made Computing Personal. The Sloan Technology Series. New York: Viking. ISBN 0670899763. Zachary, G. Pascal. 1997. Endless Frontier: Vannevar Bush, Engineer of the American Century. New York: Free Press. ISBN 0684828219. This page was last modified on 20 March 2018, at 22:31.